in 2007 with two hives and now manages Barrington Farms Apiary, LLC with 75 hives in Coweta County, Georgia. 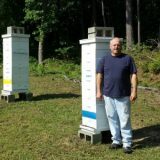 He is the president of the Coweta Beekeepers Association and a Certified Beekeeper in the Georgia Master Beekeeper Program. Steven developed Coweta Sustainable Beekeeping in 2014, a simple, sustainable beekeeping method for small beekeepers.